Visakhapatanam : Vice President of India, Shri M. Venkaiah Naidu has called for concerted efforts to eliminate the menace of terrorism, tackle climate change, remove social inequalities, alleviate poverty and minimize the urban rural divide to build a peaceful, harmonious and happy nation. Speaking at a felicitation function organized by the Vice President’s friends and well wishers in Visakhapatanam today following the recent conferment of Doctor Honoris Causa upon him by the Peace University of Costa Rica in recognition of his contribution to the rule of law, democracy, sustainable development and peace, he emphasized that Peace was prerequisite for progress of any nation. Any kind of conflict or strife would prevent developmental prospects of the region. “One cannot pay attention to development if there is tension”, he added. Shri Naidu said that it was the duty of every citizen to ensure that the social harmony in our country was not disturbed in any way. He called upon the media to conduct a performance audit of parties and candidates and place a progress report before the people to enable them make an informed choice. He said the people too must seek accountability and performance reports from candidates and the parties. Referring to the trend of politicians switching parties, the Vice President said that such people must resign to their posts before seeking re-election. Referring to the importance of the electoral process in strengthening democracy, he said that people should elect representatives who possess Character, Caliber, Capacity and good Conduct. 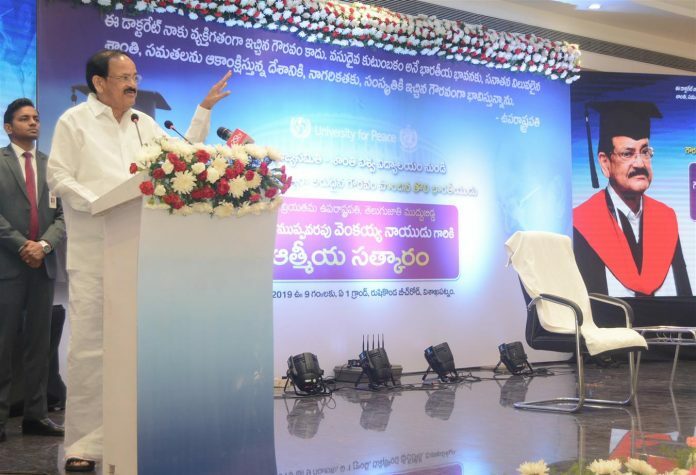 Asking people to exercise their franchise, the Shri Naidu said that vote was not just a right but a responsibility bestowed upon the citizenry by the framers of the constitution. The Vice President said that India has always been a proponent of peace and believed in the philosophy of “Vasudhaiva Kutumbakam” which treats entire world as one family. He said that India, being a votary of peace and non-violence from time immemorial, always wishes to have cordial relations with all countries and peoples around the world. Referring to the Honorary Doctorate conferred upon him, the Vice President said the honour was not for an individual but a reflection of the global acknowledgement and recognition of the age-old values of peace and harmony embedded in Indian philosophy. Observing that he felt doubly honored to have received the Honorary Doctorate at a time when the world is commemorating the 150th birth anniversary of Gandhi ji, who had demonstrated to the world the power of non-violence, he emphasized that peace was the prerequisite for progress of any nation.Any kind of conflict or strife would prevent developmental prospects of the region. Saying that India has been a victim of the menace of cross-border terrorism, the Vice President said that Terrorism could never be treated with kid gloves. He asked the world community to come together to ‘fight out and root out’ terror. Shri Naidu said that the United Nations must conclude at the earliest the deliberations on the Comprehensive Convention on International Terrorism proposed by India and take action against those promoting terror. ‘We need to name & shame those who promote terror as a state policy and cut their aid, he added. The Vice President also urged every citizen to strive to protect the environment, reduce pollution, promote greenery, conserve water bodies and ensure that development does not disrupt natural resources.